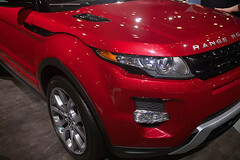 The 2012 Land Rover Evoque is an all-new model from the storied British SUV manufacturer. It is expected to go on sale in the U.S. this October. The Evoque emphasize the sport in SUV. In terms of price, it fits in between the LR2 and LR4 in Land Rover’s product lineup. However, the Evoque is the smallest Land Rover SUV. The Evoque has been in the planning for years. A near production concept of the model was shown at the 2008 North American International Auto Show, as the Land Rover LRX. As part of a 27 million pound grant from the UK government, the Evoque is being manufactured at the company’s Halewood, Liverwood, England facility. In the U.S., the Evoque will be offered with just engine choice for 2012 with a 2.0-liter 237 horsepower turbocharged four-cylinder engine. This EcoBoost engine is built by Ford. The engine will also be seen in the 2012 Ford Explorer. The turbo-charged four will be the most fuel-efficient gas-powered engine ever offered by Land Rover. In the heavier Explorer, the engine is rated as 18-mpg city and 26-mpg highway. Other markets will have the option of a 2.2-liter four-cylinder diesel engine and front-wheel drive for improved fuel economy. The Evoque is an important model for Land Rover. 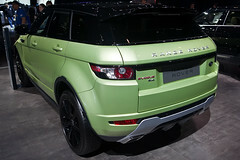 It is the first model developed by Land Rover’s Indian parent company Tata Motors. Instead of using the 3.2-liter, 230 horsepower inline 6-cylinder engine used in the LR2, Land Rover has opted to use the Ford EcoBoost engine, which is lighter, more powerful and more fuel-efficient. The Evoque weighs about 600 pounds less than an LR2 and is more aerodynamic. A six-speed automatic transmission is standard. Land Rover estimates the Evoque’s 0-60 time is 7.1 seconds. The Evoque will be available in the U.S. as a two or four door, five-passenger model. The model does not have a third row of seats but is noted for its otherwise roomy interiors. Its architecture is loosely based on the same platform as the LR2. Despite its sporty looks, smaller size, and 8.3 inches of body clearance, the Evoque will still have significant off-road capability. The model has the best approach, break-over and departure angles among compact SUVs. In the U.S., all-wheel drive will be a standard feature. Fitting its sporty appearance, the Evoque comes standard with 19” wheel rims (20” is optional). It will be offered in three trim lines: Pure, Dynamic, and Prestige. The Prestige trim is highly luxurious offering 10 square meters of leather. The Evoque’s starting price is expected to start at about $45,000 when it debuts this fall. The model competes in the burgeoning premium compact SUV class. Its competitors include the BMW X3, Acura RDX, and Audi Q5. Do you like the styling of the 2012 Land Rover Evoque?